We are excited to own this guy. After all of the shows were over, many people thought this was the best hog in the entire national show circuit. We agreed. Not very often do you get a chance to add a giant piece to a puzzle like this guy here. Ladies Man does not have a tight bone, tight joint or tight muscle in his body but yet he is big legged, clean jointed and has lots of muscle. Judge Willie Kirkpatrick maybe said it best when he said maybe the best Yorkshire boar he has ever had an opportunity to make Grand Champion. Ladies Man was raised on a Cargill floor eating normal hog feed until 2 weeks before the show. Very Natural. 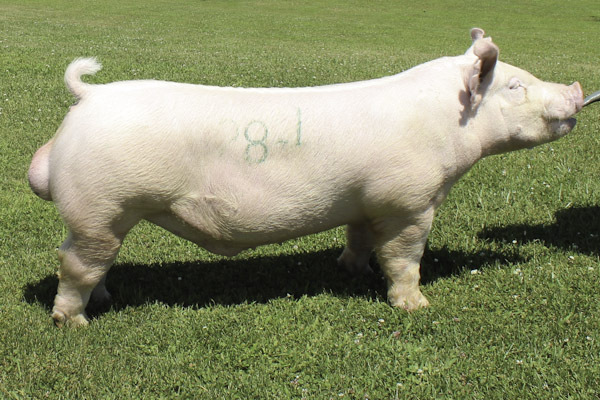 From the ground up he is one big footed, big legged, clean jointed Yorkshire boar with tremendous flexibility. Notice how far back he can get is back leg back behind his tail head and still have his back foot square on the ground. He has a big square rib and an agile spine and is extra long necked and headed. High tail set and a great package of muscle. He is wide in his chest floor and has a tremendous set to his back feet. This guys legs are huge and he can travel all day and never gets tight. This guy will sire offspring that can win major shows. Tremendous for those National Jr. Gilts and barrows that can compete anywhere with the ability to move free and square across any ring.